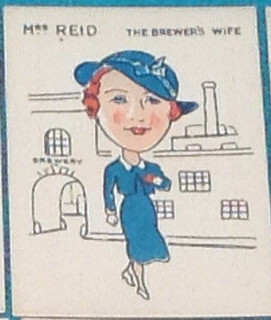 Sunday’s ad is for Michelob, one of the brands created by Anheuser-Busch as a draft-only beer in 1896. It was first packaged in 1961, and its distinctive teardrop bottle won a design award the following year. But that was replaced in 1967 “for efficiency in the production line,” but reverted to a traditional bottle in 2002. 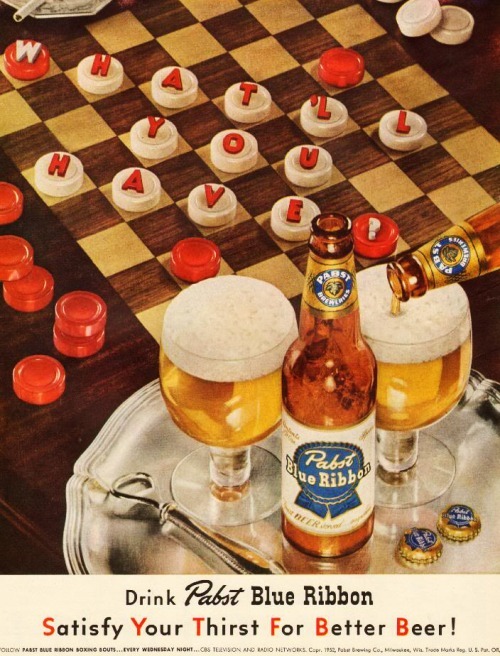 This ad is from 1971, and features a bottle and mug of beer along with a gold ball and scorecard. This ad was the back of the program for the 1971 Ryder Cup. 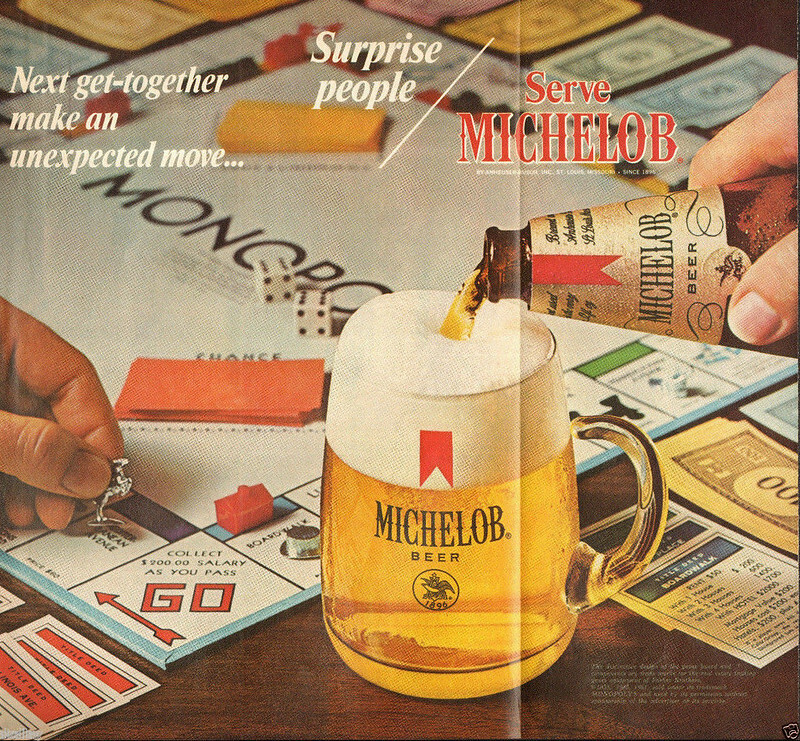 Saturday’s ad is for Michelob, one of the brands created by Anheuser-Busch as a draft-only beer in 1896. 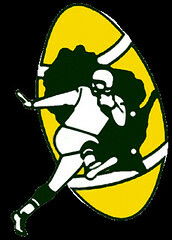 It was first packaged in 1961, and its distinctive teardrop bottle won a design award the following year. But that was replaced in 1967 “for efficiency in the production line,” but reverted to a traditional bottle in 2002. This ad is from 1972, and features an on-going game of Monopoly, and somebody has a hotel on Boardwalk. Whoever is playing the Hat is going to need that beer. 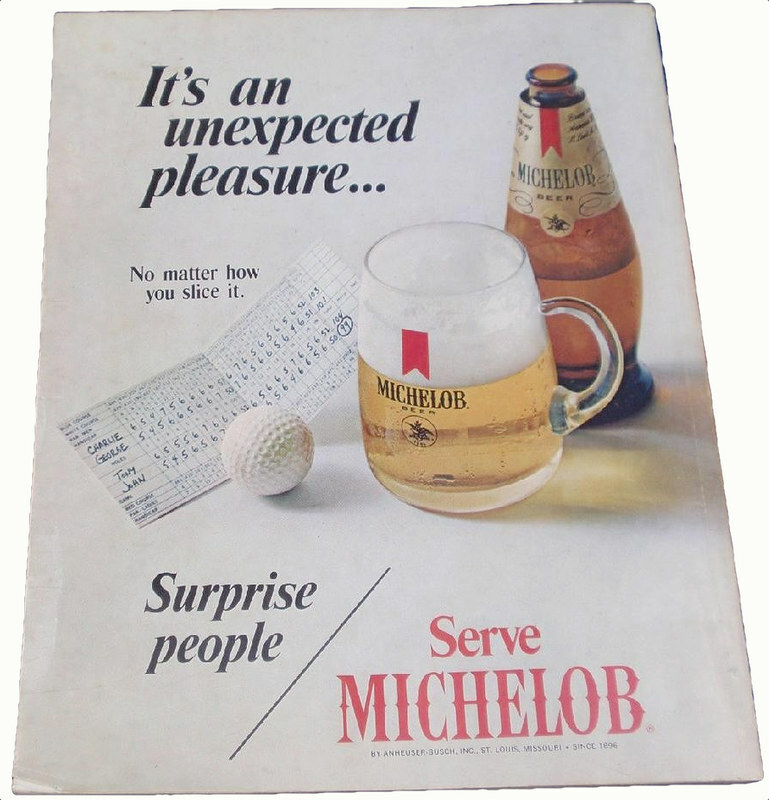 Friday’s ad is for Michelob, one of the brands created by Anheuser-Busch as a draft-only beer in 1896. It was first packaged in 1961, and its distinctive teardrop bottle won a design award the following year. But that was replaced in 1967 “for efficiency in the production line,” but reverted to a traditional bottle in 2002. 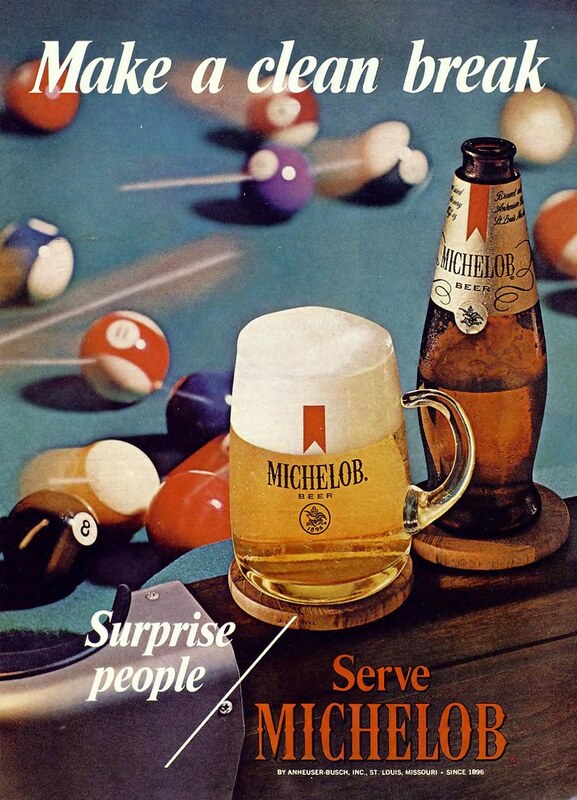 This ad is from 1972, and features a bottle and mug of Michelob sitting on the edge of a pool table. Saturday’s ad is entitled An Evening of Cards, and the illustration was done in 1954 by Douglass Crockwell. 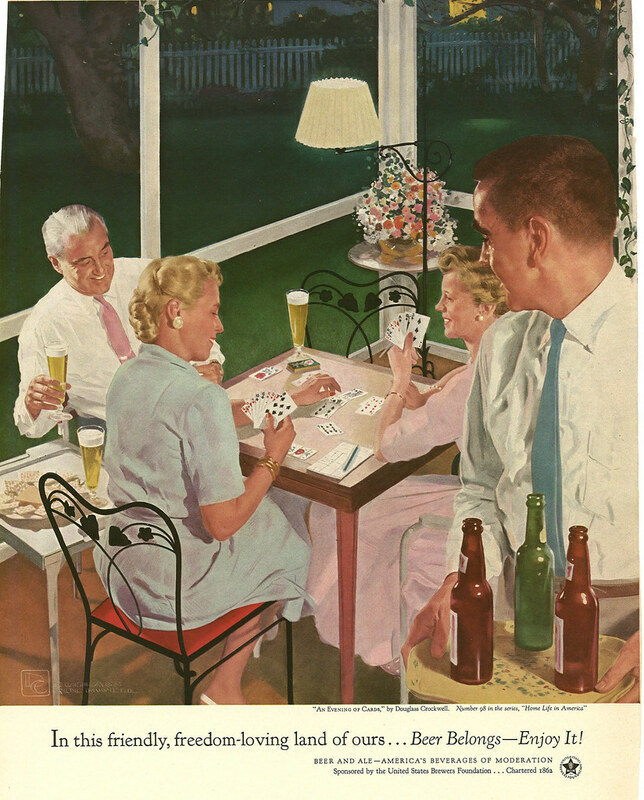 It’s #98 in a series entitled “Home Life in America,” also known as the Beer Belongs series of ads that the United States Brewers Foundation ran from 1945 to 1956. In this ad, two couples are spending an evening playing cards, most likely bridge at this time period. 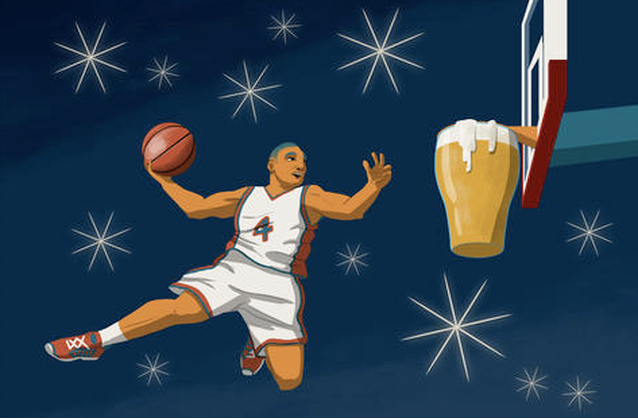 At least that’s an activity that fairly cries out for beer. 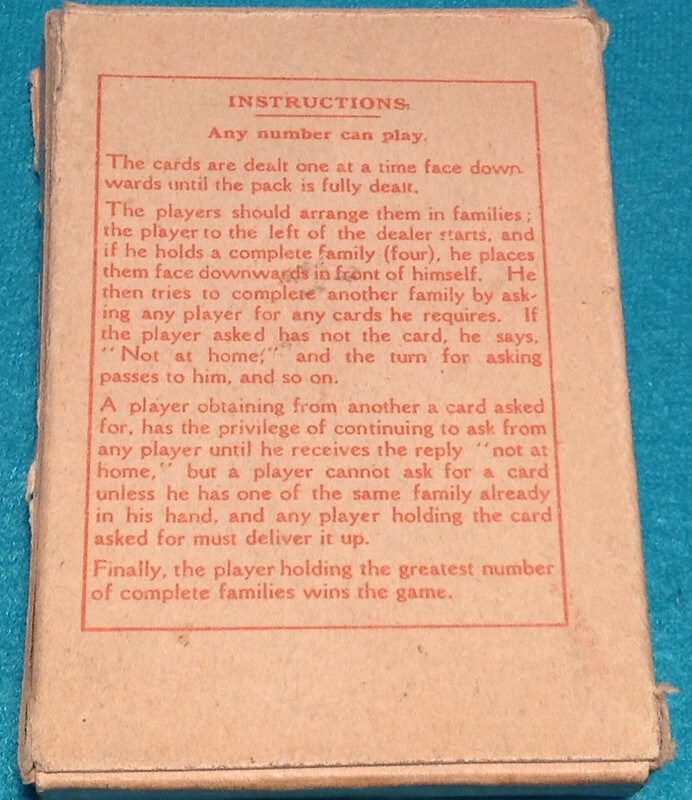 I remember my parents having people over, not to play bridge, but pinochle, which really popular when I was a kid. I also recall being in a pinochle club in junior high, where we’d play during the lunch period. I don’t know if it’s a generational thing, or geographic, but nobody I know plays pinochle in California, which is a shame. I may not be college basketball’s biggest fan, but I do still enjoy March Madness every year. 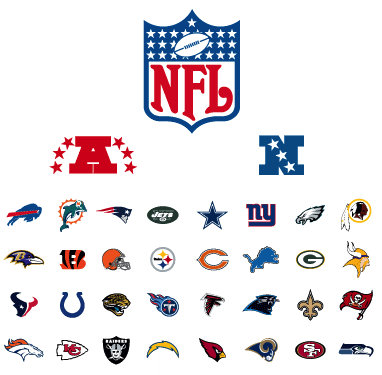 The tournament is usually a fun diversion for a few weeks each year, so for the sixth straight year, I’ve set up a fantasy game, similar to fantasy football. 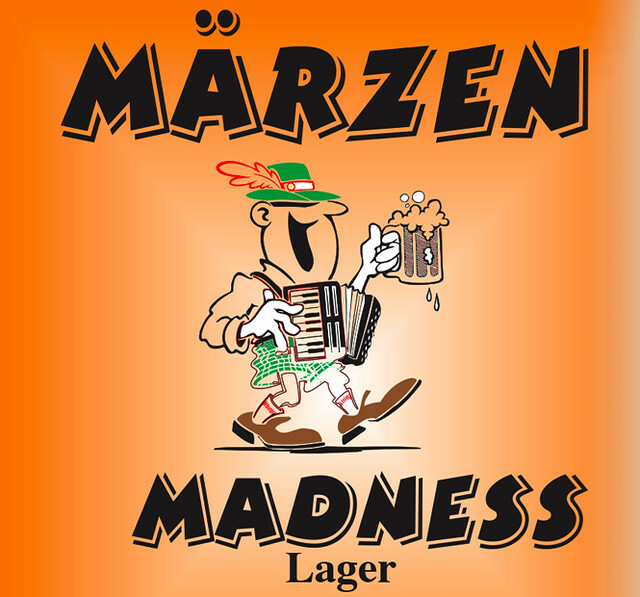 It’s a bracket game through Yahoo which I call “Märzen Madness.” It doesn’t look like there’s a limit to the number of people who can play, so sign up and make your picks starting right now, and make sure you’re don choosing before March 17, which is when the first games take place. 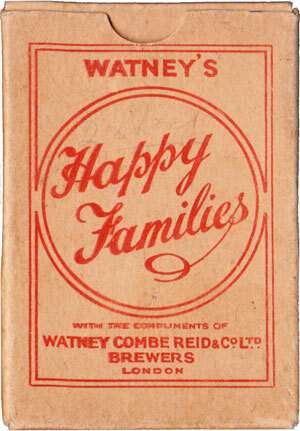 The other night Boak & Bailey tweeted a photo of a UK eBay listing for a card game published in the 1930s by Watney Combe Reid & Co. LTD, brewers of Watney’s Red Barrel. One of the many things I’m obsessed with is games. Since I was a kid, I’ve played them, collected them, and even created them. It’s just one more thing to add to the ever-growing list of things about which I’m particularly geeky. So I was already familiar with the card game Happy Families, which is a fairly simple game, and is somewhat similar to “Go Fish.” But I had no idea that a brewery had made their own version of the game. 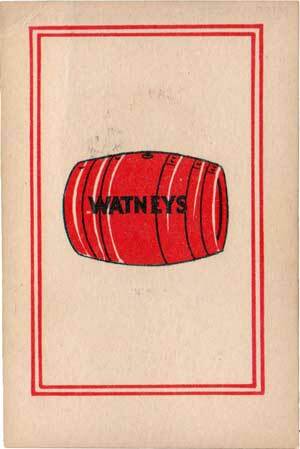 Based on the box, it was obviously a giveaway to advertise the Watney’s brand. Intrigued, I would have bought it on the spot, except that, as Boak & Bailey noted, the “Buy It Now” price was a hefty £64.95, or about $100. 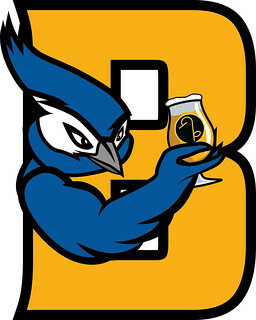 Beer writing, unfortunately, doesn’t pay well enough to indulge all of my whims. Still, I wanted to know more about the game, and set out to see what I could find. Although the 1920s was a decade of optimism after the Great War, the Great Depression made the 1930s a difficult time. In Britain unemployment was widespread. 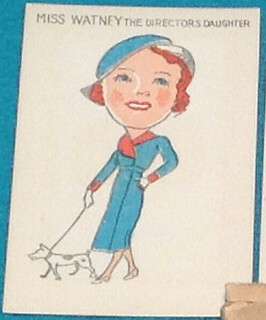 As we see from these images, the woman was the homemaker and had a hairdo, and the man worked. The generation of children who grew up in the 1930s would go on to fight in World War II. They had their share of hardships and built strong values of hard work. For two of them, they apparently didn’t have a finished card, so here’s those cards taken from the eBay listing photos. Hopefully, I can find a less expensive deck of these cards. Great, another item to add to my Wishlist.